Explore the world via Columbia’s Sister Cities: Columbia/Howard County residents can experience the varied cultures of Columbia’s Sister Cities in Europe, Africa and the Caribbean through a variety of trips and exchanges. Columbia Association does not organize trips to its sister cities, but travel is offered from time to time via outside travel agents. Reference on this site to any specific trip, program or service, or the use of any organization, firm or corporation name is for the information and convenience of the public, and does not constitute endorsement, recommendation or favoring by CA. Are you curious about what life is like in Columbia’s sister cities in Ghana (West Africa) or China (Asia)? This year, two trips are being offered that will allow you to visit Columbia’s newest sister cities: Tema, Ghana (since 2014). and Liyang, China (since September 2018). In 2019, you can take a 10-day trip to Ghana in West Africa in August. And in October, you can visit China for 15 days. Both tours are very reasonably priced and offer the opportunity to travel with people from this area. The Ghana trip will take place from Monday, August 12 through Friday, August 23. Ghana has declared 2019 the “Year of Return” as it marks 400 years since the first slaves arrived in Virginia. The trip is open to adults and children ages 13 and older. 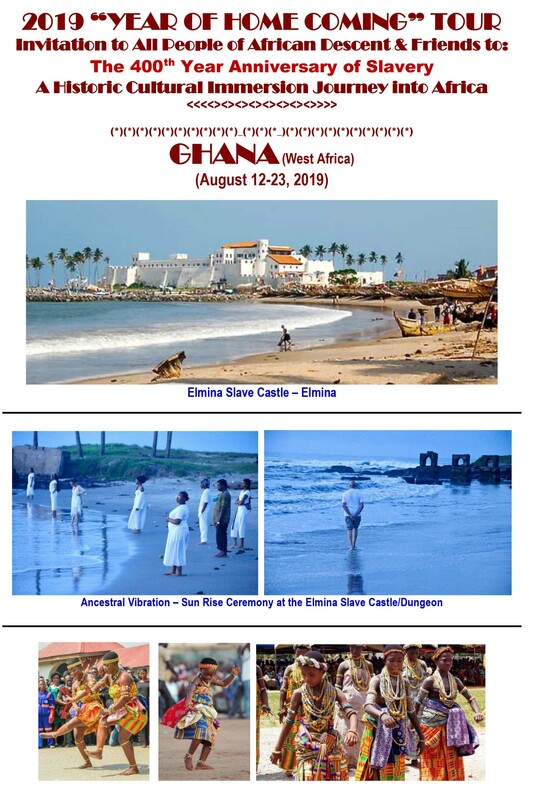 People of African descent and their friends are especially encouraged to visit Ghana this year to learn about the culture and history of the country from which so many ships holding enslaved Africans departed — many of whom were not from Ghana. The trip is organized by Gabriel Pomary of Intraworld Travel. For more information, email intragav@aol.com or call 202-460-4959. The Ghana trip itinerary is here and includes the price and registration information. The China trip will take place from Wednesday, October 16 through Thursday, October 31. The 15-day trip to China will take you to Beijing, Xian, Suzhou, Hangzhou, Shanghai and Columbia’s sister city, Liyang. You’ll experience the fascinating landscape and history of ancient China and be amazed by the breathtaking pace of modern China. The trip is organized by Jun Han of Success International Mutual Liaison Services. For more information, email jhan@success-international.org or call 202-288-8228. 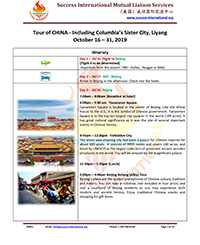 The China trip itinerary is here and includes the price and registration information. For questions about Columbia’s sister cities, please contact Laura Smit — program manager for CA’s International Exchange and Multicultural Programs — at International@ColumbiaAssociation.org or 410-715-3162. Art, Culture and Culinary Exchanges: CA occasionally conducts exchanges for adults involving art, cuisine, architecture and other forms of culture. There have been several cuisines and art exchanges with Columbia’s sister city in France, Cergy-Pontoise, and a culinary exchange with Tres Cantos, Spain is being planned for spring 2018. Adults travel to one of Columbia’s sister cities as a group, live with host families, and experience the culture and sights of that city/country. Often these same adults host visitors from the other city in the next year. Hosting adults from Columbia’s Sister Cities: Columbia/Howard County families can host an adult international visitor from one of Columbia’s four Sister Cities: Cergy-Pontoise, France; Tres Cantos, Spain; and Tema, Ghana. There are also often requests for hosts for visitors coming to our area for State Department or USAID study groups. State Department visits are coordinated by the World Trade Center Institute in Baltimore (wtci.org). For more information on upcoming exchanges and hosting, email International@ColumbiaAssociation.org.